Somerville, Mass – I’m not sure why I continue to title this series “Raising Bilingual Kids”, as the twins are hardly bilingual at this stage in their lives. But we are still trying! Over the years, we have tested out just about every kids’ Spanish program in the Boston area, including a new one this summer. The jury is still out on whether this is actually helping them learn Spanish. But we are still trying! Canta y Baila Conmigo, by Groovy Baby Music. Groovy Baby does popular music classes for babies and toddlers. Canta y Baila Conmigo is the Spanish version of the class. The children play instruments and dance, while the instructor sings songs in Spanish. 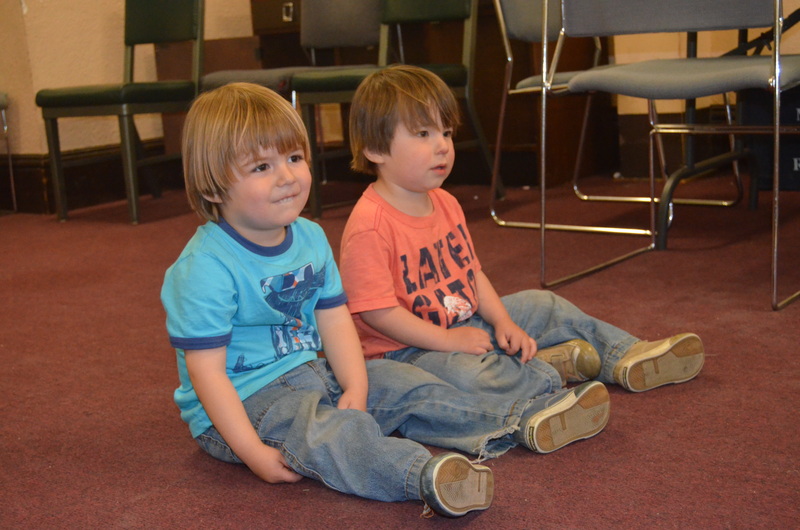 The twins took these classes with their babysitter for almost two years, on and off. They seemed to love it. But did they learn the songs? Not so much. (Maybe they would have learned the songs if we had listened to the CDs more at home.) Still, I’m sure that this early exposure–to music and to Spanish–is valuable. Indeed, the class is supposed to be for kids age 0 to 5, but the class was mostly babies, and my guys started to lose interest when they were in their third year. Hola-La. The guys did this for one semester right around the time they turned three. They were shy about participating and it was hard to keep their attention on the class, but they sure loved those puppet shows. As you can read here, I was thrilled with this class, because this was the first time I heard the twins actually speaking Spanish words. Unfortunately, Hola-La stopped offering classes in Massachusetts, so we did not continue with them, though I see there are now classes in Hopkinton. The twins watching a puppet show at Hola-La. 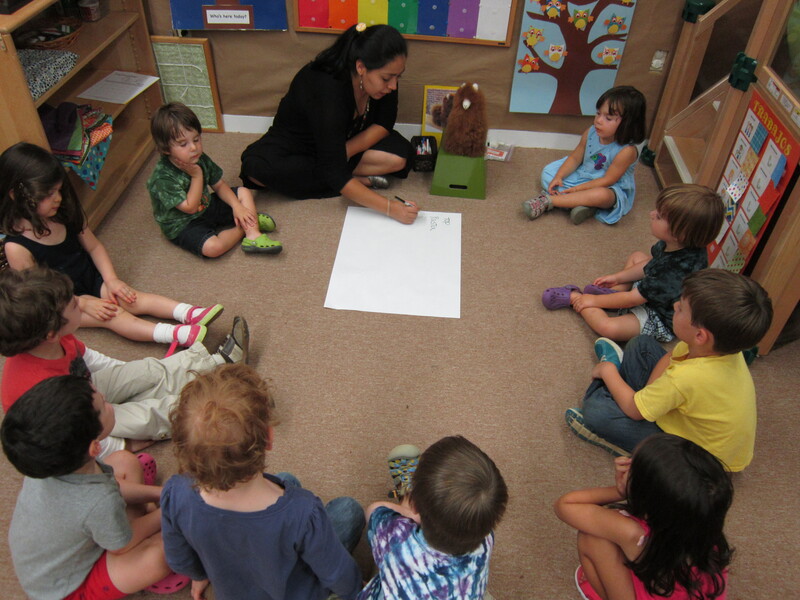 Spanish Immersion Preschool. The twins did one-year of Spanish-immersion preschool at a wonderful private school. It was a fantastic experience for all of us. It’s not really fair to compare this to the other programs, since it was three hours a day, four days a week. (It was also very expensive.) They also offer a summer camp, which is not quite as intimate (and not quite as expensive). They learned songs, colors, numbers and other vocabulary, which–for the first time–they started to use spontaneously. Once the twins turned four, however, they became eligible for the pre-K program at our local public school and we could no longer justify the expense of the private school. Trade-offs. Yak Academy I signed the twins up for a once-a-week class at a new kids’ language school in neighboring Arlington. I was hopeful that this 75 minutes per week would help them retain something that they had learned at their preschool. The curriculum incorporated crafts and songs and other activities to help the kids learn vocabulary words. The teacher only spoke Spanish to the children. The facility was very nice; the twins liked the teacher; and they seemed to have fun in the class. My only complaint, oddly, was that they did not seem to feel any pressure to learn the words or practice using them. I think the program was designed so that it would not be stressful for the children, which I respect; but there was no way to ensure that the kids were actually learning. (One day they made paper airplanes in class, which the twins loved, but afterwards they could not tell me how to say “airplane” in Spanish.) Worse, they started to put up resistance to this class. They were already going to school five hours a day, which is a lot for a four-year-old, so maybe they were reacting to the extra hour of tutelage. Or, maybe they were reacting to the fact that they had to leave their friends at the playground to come to class, which they resented. We stuck it out for the year, but I feared they would develop a resistance to learning the language at all. Intercultura Spanish School and CPI-Monteverde we took a break from Spanish during kindergarten, but the twins did two one-week program when we were in Costa Rica (as I wrote about here and here). An in-country program is ideal, of course, as the twins heard people speaking Spanish all around them, and they could practice with anyone they met. And they did! They became proficient with greetings and very basic introductory questions. This was the most progress I had seen in several years, so I’ll take it. On the way to Spanish school at CPI-Monteverde. This summer, I felt it was critical that we use some of our free time to get reacquainted with Spanish. 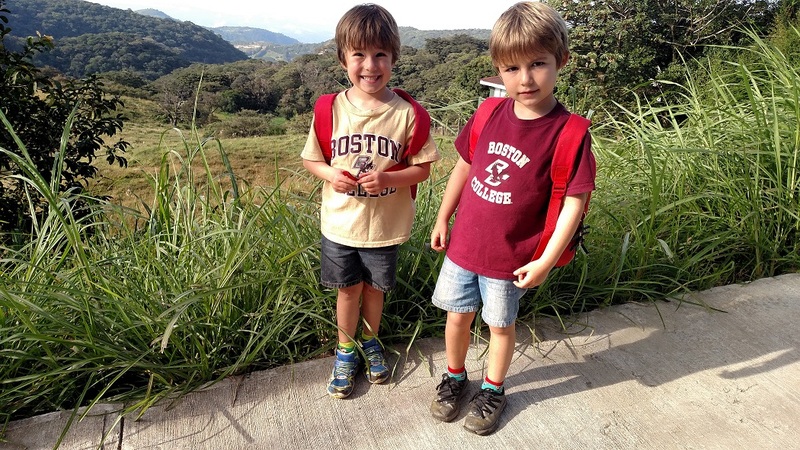 Much to Daddio’s chagrin, I signed the twins up for two weeks at the Rola Language Institute. Stay tuned to find out how it went!